Drill bits are the most common accessory for drills. There are many different drill bit types, with each being designed for different, specific applications and operated in different ways. It is important to note that you should not use a drill bit that exceeds the maximum drilling capacities of your drill, as this could cause permanent damage to your tool. Also known as ‘twist’ drill bits, these bits are the most common of the many drill bit types and are ideal for everyday drilling through wood, metal and plastics. They will normally have a cylindrical shank, but some will be modified to feature a ¼” hex shank. This shank also allows tools such as cordless screwdrivers and impact drivers to perform small drilling tasks. These drill bits have a brad point tip (also known as a W-point tip) that allows the outside cutting edges of the drill to cut the diameter of the hole before the centre breaks through. This results in the bit not grabbing and producing a very clean hole. It is therefore perfect for drilling into wood and some plastics and for jobs like dowelling. These drill bits will sometimes come packaged with small rubber rings called depth stops that fit around the bit and allow you to choose the depth you would like to drill to. These tungsten carbide tipped bits are used on hammer drills (on hammer mode) for drilling into bricks, concrete, and stone. Some professional quality masonry drill bits will also feature a hexagonal shank (instead of a cylindrical shank) to stop the bits from slipping in the chuck when the drill is experiencing substantial loads, and also a percussion ground carbide tip. These drill bits heat up rapidly during use, and this can melt the tungsten brazing on the drill bit’s tip, allowing the tip to move and chip when drilling. To keep the temperature of the bit down, you should withdraw the bit regularly to clean its flutes and use the correct drilling RPM. When they are used correctly, the titanium nitride coating greatly extends the cutting life of these drill bits (4-6 times longer than conventional drills) by reducing any heat build-up and increasing the bit’s lubricity. Just like regular HSS drill bits, they can be used on wood, metal and plastics. These drill bits allow you to drill a larger hole than your drill’s chuck would normally allow. For instance, if you have a 13mm (½”) chuck, you can get a reduced shank drill bit with a 16mm diameter and a 13mm shank. These bits can drill through wood, metal and plastics. If you decide to use a pilot drill first, the diameter of the pilot drill should not exceed 25% of the reduced shank bit’s diameter. Especially designed for drilling holes for rivets, these drill bits commonly have flutes on both ends, so you can get twice as many holes out of one drill bit. These bits are only designed for shallow holes through thin metal, where the hole is no deeper than 1.25 x ‘the diameter of the hole’. Note that the drill hole must be larger than the rivet size to allow for the expansion of the rivet, and to reduce the metal’s fatigue. Using an expanded brad point tip with angle spurs and a distinguishable spike, spade bits are a drill bit type used exclusively for drilling large holes through wood. They most commonly feature a ¼”” hex shank, come in a range from 6-38mm in diameter, and can be combined with an extension shank to extend their reach. Auger bits are capable of drilling very large holes with ease and are designed only for drilling into thick, hard and dry timber. The screw thread at the tip of the drill bit draws the drill bit into the material – eliminating the need to push – whilst the single-spur cutting edge scribes the circumference of the hole for a smoother finish and the large flutes on the drill bit rapidly remove the woodchips. They commonly have a hexagonal shank to create a firmer and more secure connection between the chuck and the bit. Countersink bits are used to create a bevelled opening at the top of a pilot hole. They are generally found in 13mm (1/2? ), 16mm (5/8? ), and 19mm (3/4?) sizes. There are also different styles for metal and wood. These bits are simply the combination of a HSS drill bit and a countersink drill bit and are the best all in one solution for drilling pilot holes for countersunk-head screws. The drill bit is secured to the bit via a small grub screw (turned by an allen key) and can be adjusted up and down so it sits at the desired length. They are usually identified by the size of the screw they are designed pre-drill for, e.g. 6G (gauge), 8G, 10G etc. Self-centering drill bits are designed for drilling accurate pilot holes in hinges and other hardware. The end of this drill bit type sits comfortably in the hardware’s countersunk holes and automatically aligns itself to the centre of the hole. When pressure is placed on the bit, the spring-loaded drill bit is pushed out of the metal sleeve and and into the work and leaves you with a perfectly centered hole. Just like drill/countersink drill bits, the internal HSS drill bit can be replaced via a small grub screw. Self-centering bits are also identified by the size of screw they are meant to pre-drill. These tungsten carbide tipped drill bits are designed for drilling smooth holes in glass and ceramic surfaces, including porcelain (with the exception of toughened glass). They have a precision diamond ground carbide tip for exact pilot drilling with tip that shaves rather than cuts. They must be run at a very slow speed, with no hammer action, and with the use of coolant (such as water, turpentine or kerosene). If the drill bit slips along the surface prior to drilling, simply scratch the surface of the tile or apply some masking tape. If operated carefully, a masonry drill bit may also be used (without a drill’s hammer mode engaged) in the same manner for this purpose but it will not give you as smooth a finish. This specialised drill bit type is generally used for hard-surfaced masonry, including porcelain. Drilling must commence on a 45° angle to the cutting surface to prevent the bit slipping, and then slowly straightened as drilling progresses. For the bit to perform properly, it needs to operate at a very slow speed and be constantly supplied with water. Due to the design of these drill bits, the hole they bore may be just slightly larger than the stated size. SDS drill bits are used in a rotary hammer drills (on rotary hammer drilling mode) for boring holes into dense masonry, and have special fitment slots on their shank to allow for rapid drill bit changes. SDS was originally invented by Bosch in 1975 and stood for “Steck, Dreh, Sitzt,” which roughly translates to “stick, turn, seated.” The letters SDS are now internationally accepted as meaning “Special Direct System.” There are different types of SDS drill bits depending on the power output of the drill; the the two most common being SDS-Plus and SDS-Max. These bits are designed for extensive and efficient masonry drilling and will last much longer than standard masonry drill bits. Step drills almost take on a conical shape, but follow a staircase profile from a narrow point to a large base. This design allows you to buy just one drill bit and achieve multiple sizes holes. They are ideal for making holes in soft, thin materials, for enlarging holes that have already been made, or for light deburring. They generally have a titanium-nitride coating to reduce their heat build-up and keep them fairly well lubricated. There is also a very similar drill bit without the steps that is appropriately named a ‘conical bit’. There are a few pointers that, when followed, will preserve the life of any of the above drill bit types. 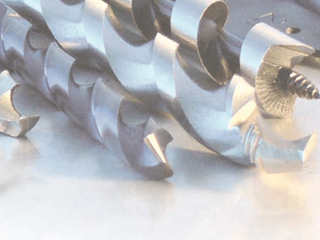 Hard materials require slow drilling speeds, and soft materials require faster drilling speeds. Also, speeds should generally be decreased as the hole becomes deeper. For accurate recommended drilling speeds for HSS drill bits see the formula below. You can centre punch holes first for more accurate drilling. For better drilling results, apply cutting fluid to the bit when drilling metals (with the exception of brass and iron). Always let the drill bit cool naturally. Never force them to cool down in water (or any other liquid). Large drill bits will transfer substantial reaction forces onto the drill, so be prepared to hang on! All drill bits should be lifted frequently to clear material from their flutes, and also to increase air flow around the bit to help it cool. Always ensure bits are sharp to ensure less load on the power tool and better cutting results. Always apply pressure in a straight line with the drill bit. You should apply enough so as to keep the drill biting, but not so much that the tool’s motor stalls or the bit deflects. To prevent breaking through the material, reduce the pressure you are applying and ease the bit through the last part of the hole. ‘Bit Diameter’ is measured in millimetres (mm) and refers to the size of HSS drill bit you are using. ‘Cutting Speed’ is measured in metres per minute (m/min) and can be sourced from the below table for the specific material you are drilling. Simply input both the correct bit diameter and cutting speed into the formula and calculate the required RPM for your application. Please note that the calculated speeds should only be used as a guide, and that depending on the various factors at work, including the specific grade of the material and cutting fluid availability, changes may need to be made to the calculated RPM. It is best to start with a slower speed, observe the cutting action, and increase it if needed.